Don't worry! Join different levels of ski lessons with well experienced instructors! 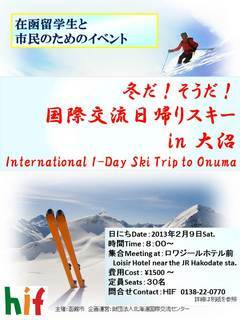 集合　Meeting point:　８am ロワジールホテル前　Loisir Hotel near JR Hakodate Sta. Read the details below and email or fax by Jan.30. 2013.